It’s finally here! I’m releasing my TD e-Series Excel Portfolio Tracker! When it comes to software, applications, or even spreadsheets to track your TD e-Series investments, I’ve found there is very little support on the web. I used to use Google Finance to track my portfolio, but they shut down that functionality unfortunately. Over time, I realized that the solution I was looking for to track my portfolio wasn’t out there – so I decided to make my own. After requests from many of you, I’m releasing it for download! Version 1.4 – Unhid ‘Data from web’ sheet to fix Macro error, updated parse error that was causing incorrect data to be copied to the ‘TD e-Series Price Lost’ sheet when automatically downloading index fund prices. Version 1.5 – Updated macro to detect if there is a parse issue, and remove the extra data from the ‘TD e-Series Price List’ sheet if it starts with incorrect data. 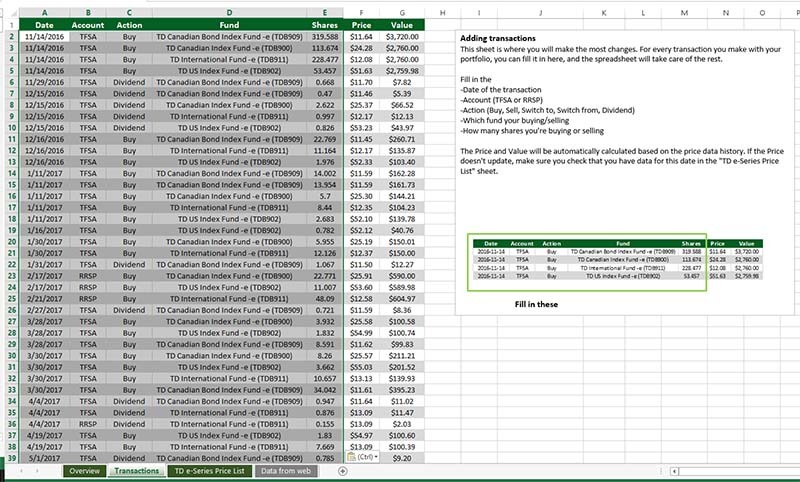 The excel spreadsheet I created allows you to track all of your TD e-Series transactions in both your TFSA and RRSP accounts, pull recent fund price data from the web, store information about the value of your portfolio on any given day, and show the return of your portfolio over a given period of time! The spreadsheet uses Macro’s to run a lot of it’s functionality – that’s why it is an .XLSM file extension, and that’s why you’ll need to Enable Content for the spreadsheet to work properly. It can be a little nerve wracking enabling content on an excel file you download from the internet, but I assure you there is no funny busy with this file – all it does in the background is calculations, and connect to the web to download current fund prices. The tracker will download the data, parse the information, and add it to the overall TD e-Series price list history. This function will take a little bit of time, and will cycle through the different sheets of the excel file while it is working. You will get a message when it is all done. It was built and designed in both Microsoft Excel 2013 and 2016 for Windows. I haven’t tried it in older versions of Excel or on Mac compatible version – so don’t know how well it will work if you are using those versions. It holds a lot of data and does a lot of calculations, so it’s not the fastest running spreadsheet. If it goes too slow for you, you can turn off “Automatic Calculations” (in the Formulas Ribbon) and only run calculations manually (Calculate Now option) when you add in new data. I can’t confirm that all data calculated is always correct. Price data may be inaccurate at times, and not all of the calculations and formulas have been verified. Use the data as a guide, but it may not always be 100% accurate (although it should be close). Please don’t re-distribute the file yourself – send friends and peers to the site to download. This gives me a better idea of how many people use it, and whether I should put more time into making it better. Please let me know if you have any feedback!!! Does something not work? Do you wish it calculated something that it doesn’t? This will hopefully be the first version of many! This is wicked excellent. Just came across your blog and i’ll stay tuned. Good work! Just a heads up – since May 2 when I started with your spreadsheet, its seemingly not pulling in the book value of the 4 funds. Is it because there is only a small amount of buy transactions (the 4 initial ‘buy ins’ and an additional)? I can switch up the formula myself to try and pull in the amounts but I dont want to mess anything up. Thanks for flagging your issue, it’s hard to fully test all the different ways someone might use the spreadsheet. It’s a bit difficult for me to investigate the issue without knowing what transactions you have tracked. 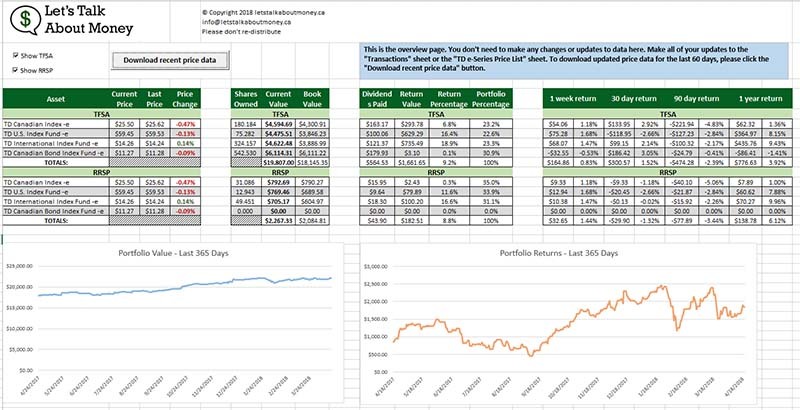 If you’re comfortable with it and would like me to follow up, can you email me (info@letstalkaboutmoney.ca) the data on your transaction page. The amounts probably don’t even matter, but if you send the dates of transactions, and with which account and which funds, I can try to re-create the error on my end of things and attempt to fix it. 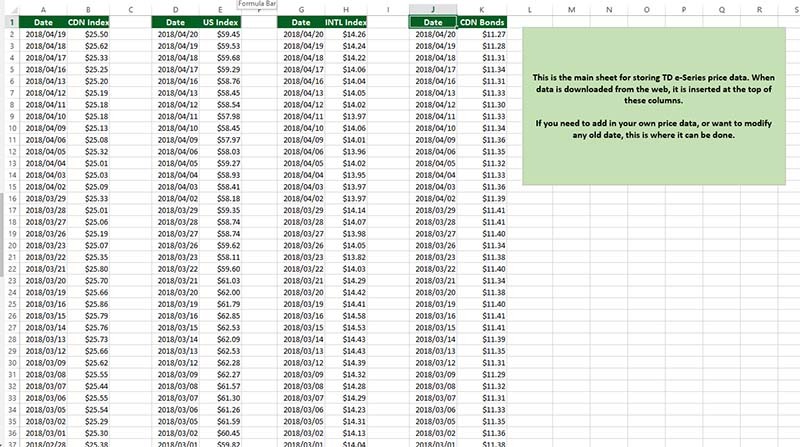 This is a great spreadsheet – thanks! Would love to have more than just 2 account options, and be able to create custom account names (i.e. “spousal rrsp”, “unregistered acct” etc). Any way you could briefly tell us how to do this? Or add that option to your sheet? Thanks! Glad you find it helpful! At first glance, I don’t think additional accounts would be particularly easy to add-on. There are some hidden sheets in the background that are doing calculations by account type (the Running Portfolio Value sheet) and track asset value by date. 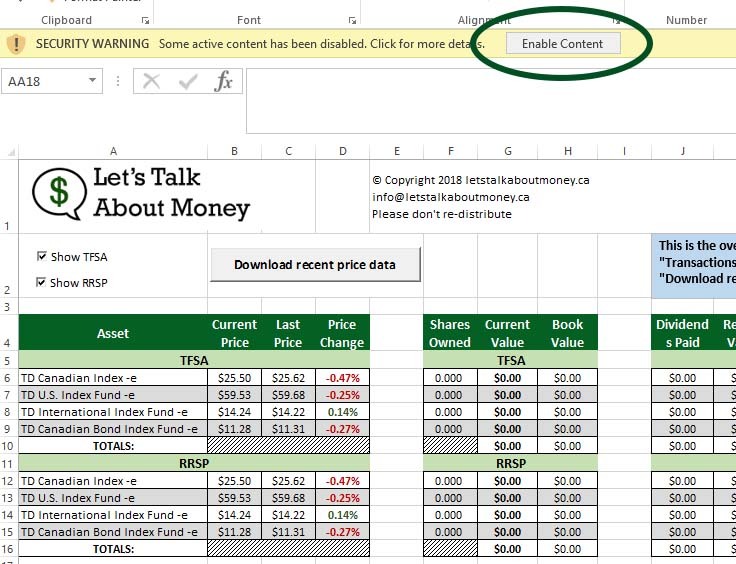 You could copy the formulas for RRSP and TFSA columns, and add a new account type, but that might be a little easier said than done, as there are a lot of account references in formulas throughout the excel file. Also, if you add more account types, you might find that it really slows down the excel file, as you’re going to greatly increase the number of calculations that need done. This is something I could look into in the future, but likely wouldn’t have time over the next few months. A simple (but not elegant) solution might just be to use multiple versions of the file, and go in with the understanding that file 1 is your registered accounts, and file 2 is your unregistered accounts. File 2 won’t have the correct account names, but it will still be able to track everything correctly. Thanks for the response – I think I’ll use the workaround you suggest of creating separate files for each account. 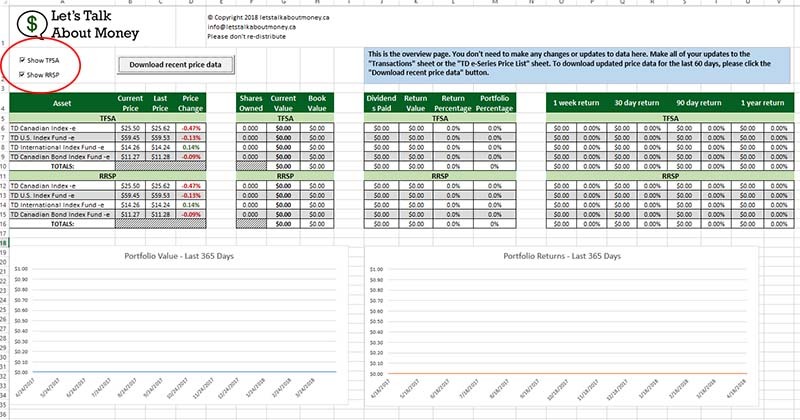 I had a mini spreadsheet on google sheets for a while but their finance funtion broke. What i like most about this is the portfolio returns chart you have, would it be possible to add seperate charts for each fund? I believe it would give a better idea of how to allocate your funds. Definitely something I have in my mind for the next iteration of the spreadsheet – a drop down menu that would allow the 2 charts to be specific to a fund/account. Not sure when I’ll get around to those kind of updates, but you could update the formulas yourself by clicking on the line in the the chart, and replacing all “$AL” values in chart 1, or “$AM” values in chart 2 with the appropriate column from the “Running Portfolio Value” sheet. For example. 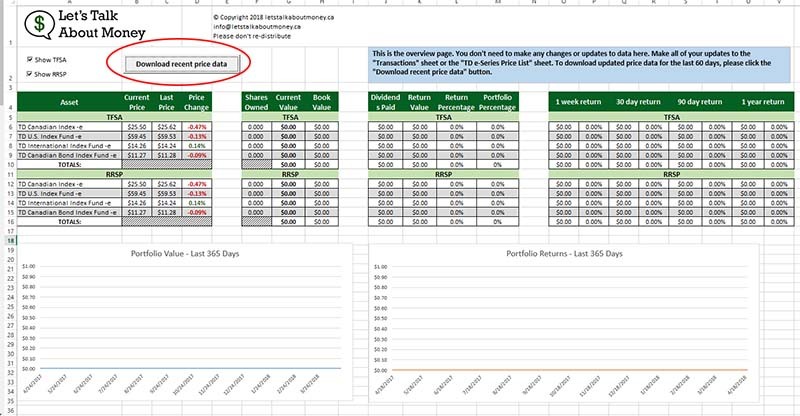 if you want to see the 365 day running profit of your TFSA Canadian Bond Index Fund, click on the line in chart 2, and when the formula comes up at the top =SERIES(‘Running Portfolio Value’!$AM$3,’Running Portfolio Value’!$A$4:$A$371,’Running Portfolio Value’!$AM$4:$AM$371,38 replace all “$AM” with “$Q”. I really like your website, it’s a good reference for my begining in that new world! Thanks! I would like to use your spreadsheet, but I always get a Visual Basic “run-time execution error 1004” when trying to download the recent price data. I tried on 2 different computers, but still getting the same error. I’m using Excel 2016. In the debug, it seems to be for the line “Sheets(“Data from web”).Select”. Glad you’ve been finding the website helpful. I took a look at the spreadsheet download, and was getting the same error that you described. Looks like it had something to do with the sheet that the data was being pulled from being hidden. I’ve updated it and fixed another minor issue as well, and have re-uploaded it as version 1.4. Let me know if that doesn’t fix the issues for you. No more error when I clicked on the “Download data” button. Don’t know if it’s because my computer and Excel are in french. Thanks a lot for your quick help! I think you might be right, if you have a different default language and/or currency it might be causing that issue. If you set your defaults to English and dollars, does that fix the problem? I have changed my default dollar sign to $ which fix the Euro issue. For the other issue, I was still getting duplicate when updating the data but I think it’s coming from the fact that it was creating all new number using a dot ( . ) and not a comma. With the test I did I see that everything is working fine when using a comma in both the Shares and Price numbers. I have manually edit all the duplicate from the past month of data I need until I figure out where it’s coming because it’s configured properly in the default settings of Windows. Many thanks, this is wicked! However I’m on MacOS and cannot not use it. Could you edit one version without Active X controls so that I can run it with my Mac? Thanks so much! Unfortunately, I think the spreadsheet might just not be compatible with MacOS. By removing the Active X controls, it would essentially break all of the functionality that is built into the excel file. Can you explain how the dividends affect the overall performance? If these are distributed but the price drops the same amount, can we ignore these and just provide our contributions? I don’t think you would want to ignore the distributions if they are offset by losses, as this would affect the calculations of the number of shares that you own, and would throw off your numbers in the future if the prices rise again. But this spreadsheet can really be used in any way that you like. If you find it easier to only track your contributions, and look at dividends separately, you can definitely do that. You’ll just have to take note in discrepancies in calculations.